Fit Foodie Megha: Chatakk - The Street Food Masters reviewed! Chatakk – Street Food Masters, is located in Kothrud near Bedekar Ganpati Mandir. They have just started four months back with a limited menu in hand but are planning to introduce few street style food in upcoming months. Initially, the concept was to start with Chatakk Misal but with huge demands from customers, special Pav Bhaji was also included in the menu. They have a centralised kitchen to supply and the ingredients of each item are weighed, measured and pre-packed in for per plate. Paavs are in-house freshly baked. With very selective varieties, following is their menu with cost. Ambience:: Located in nice, quiet, open area, Chatakk is ready to acquaint approx 20 people. They have indoor and outdoor seating. What I liked most about the serving were the utensils used. The hammered Copper plates, bowls, glass were giving it a rustic and royal look. Beautiful presentation of the dish as well certainly caught my attention! 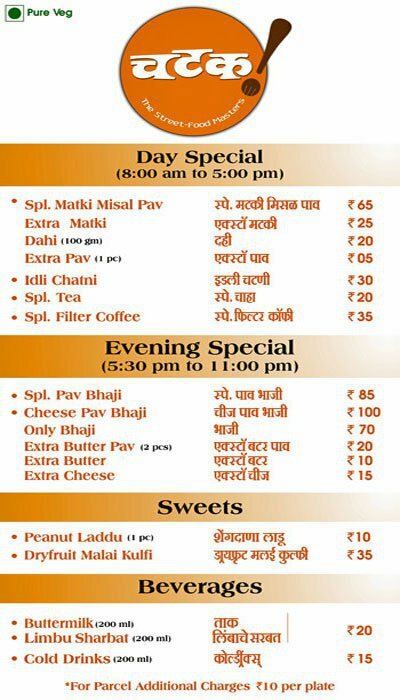 Special Matki Misal (Rs. 60) was good with sprouted matki, topped with farsan and onions in one ethnic copper bowl along with fiery tarri in another bowl. Ooh...that looked delicious. I asked for the spicier version which could have been more as per my taste. Sprouted matki should be added more to the misal.Overall, the taste was made to suit majority. Idli Chutney (Rs. 30), is a steal. Three rava idlis with chutney are served at a very reasonable cost. Idli not being their forte was bit hard from the centre and crumbly. Chutney could have had a better taste by adding ginger, curry leaves and more of coconut and green chillies. To our surprise a small handi with two gold foil covered balls and was really eager to explore it. Thought it as chocolate, it turned out to be Shengdana Ladoo (Rs.10). It was super traditional and made with love. First bite and it just melts in mouth, peanuts give a crunchy twist. Totally and highly recommended. I would go again and again to have this! Dahi vaati (Rs. 20) was made with full fat milk which you won't get at many places. Thick and fresh dahi you should never miss! Do try once and share you experience in the comments. Address:: Shop 11, Besides Bedekar Ganpati Mandir, Krishna Prasad Society, Kothrud, Pune 411038. Thanks Jessi! It is always pleasure to see you on my blog.